The Rockstar Energy Husqvarna Factory Racing Team made its way to the Show Me State for the 11th round of AMA Supercross, held at The Dome At America’s Center in St. Louis, MO on Saturday. Both Zach Osborne and Jason Anderson maintained their points lead in their respective classes with a victory for Osborne and a second-place finish for Anderson, while teammates Dean Wilson and Michael Mosiman both nailed down top-10 finishes in their classes to make for a successful night. Osborne was top-10 at the start of his 250SX East heat and quickly moved his way into the fifth-place spot. He navigated into fourth soon after and was on the move. He made his way into a podium position the following lap and stayed aggressive. He went after the top-two with 40 seconds to go, made the pass for second, then launched into the lead in the whoops in the final lap to transfer to the 250SX East Main Event. He pulled the holeshot in the Main and immediately went to battle. He went back to second, but took his time during the long race and focused on regaining the lead. He waited for his opportunity to strike and took over the lead with seven minutes and a lap to go after race leader Austin Forkner succumbed to Osborne’s pressure and went down. He stayed consistent and rode to another impressive victory to maintain his lead in the 250SX East Championship. Jason Anderson was top-five at the start of his heat and easily navigated his way into second shortly after the start. He took over the the lead before the end of the first lap and dropped the hammer to take the win and transfer to the 450 Main Event. He was second at the start of the Main and focused on a consistent race. He rode his own race and kept it steady to finish second and extend his points lead in the class. Dean Wilson was top-five at the start of his heat and moved into second soon after. He made the pass for first after Tyler Bowers went down in a corner, but went back to second with 15 seconds to go and stayed steady to finish second and transfer to the 450 Main Event. He was ninth at the start of the Main, but moved back to 11th in the second lap. He refocused and made the pass for 10th shortly after before putting in a charge to finish eighth. He is currently 10th in 450 rider point standings. Mosiman was top-five at the start of his heat but got caught behind a downed rider and moved back to 14th. He put his head down and charged his way up to ninth to transfer to the 250SX East Main Event. He was top-10 at the start of the Main and came out of the first lap in seventh. He stayed consistent, moved up to sixth in lap 10 and focused on a top-10 finish. 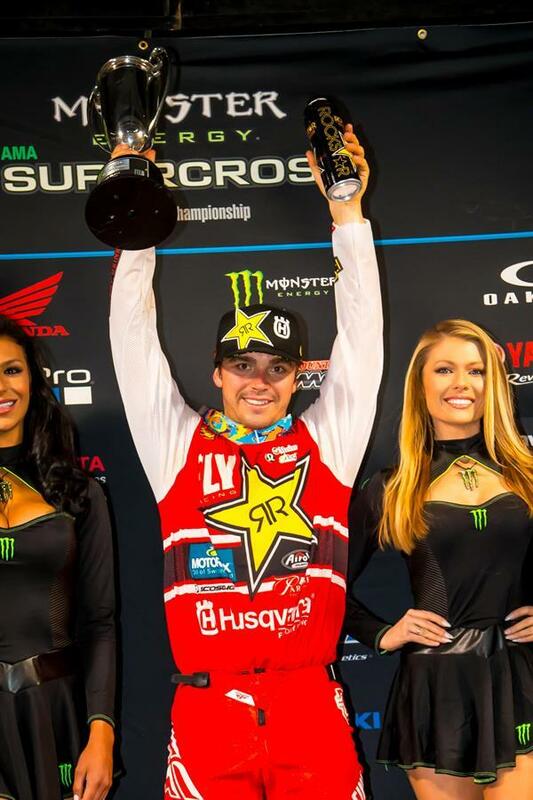 He rode steady to an eighth-place finish—his first top-10 Supercross finish.